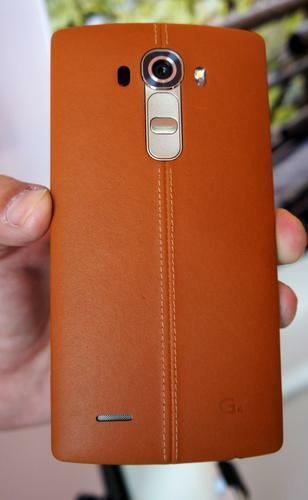 The LG G4 has a leather-covered back. Screen: Even though the G4's screen has the same size and resolution as the one on the G3 (at 5.5 inches and 1440 by 2560 pixels) it's noticeably better. LG has improved its performance in several regards, including brightness and color reproduction, making it one of the best screens ever. All those pixels put higher demands on the processor, GPU and battery, but it's nonetheless worth it. Camera: Along with the screen, the main camera is the G4's most important asset. It isn't just that the 16-megapixel camera takes great pictures -- the manual mode offers a level of flexibility competing smartphones can't match. The camera app lets users control the focus, shutter speed, ISO and white balance. There is also the option to save photos in RAW format, in addition to JPEG. For people who aren't used the controlling all those settings, the manual mode may feel a bit daunting at first. Performance: The G4 is the first phone to have Qualcomm's Snapdragon 808 under the hood. The chip uses six cores instead of the eight cores on the processors that power competing Android-based products. That has resulted in less than stellar benchmarks. However, in the real world there is little to tell it apart from any other high-end smartphone. Feature omissions: LG is rightly getting kudos for sticking with memory expansion using microSD cards and an exchangeable battery. At the same time there are a couple of features missing in the standard package, including wireless charging. If you are ready to lose the leather back, you can buy an extra case to get it. Missing altogether is an integrated fingerprint reader and waterproofing. The latter is another feature that unfortunately seems to have fallen out of favor. Size: When the G4 was still under development it was rumored to come with a smaller screen than the G3, but in the end LG decided to stick with a 5.5-inch. That sets LG apart from its two biggest competitors; Apple and Samsung. Both companies let buyers choose if they want a flagship smartphone with a large or a larger screen, with the iPhone 6 and 6 Plus or the Galaxy S6 and Galaxy Note 4, which is a better approach. The G4 is also a bit bigger and heavier than the G3. Appearance: The G4's leather back has gotten mixed reviews. The material, however, helps the smartphone stand out and gives the phone a pleasant texture and feels better to hold than the Galaxy S6 and the HTC One M9. But the G4's overall design isn't a winner because the materials used for the side and front aren't up to snuff. For users who don't want a leather smartphone, an alternative model uses a mixture of ceramics and polycarbonate, but it just looks cheap. There are smartphones that cost less than $300 and look better, which isn't the way its supposed to be. Overall, the G4 is a solid, incremental upgrade over the G3, but LG probably has the potential to build something better if its developers and designers were to be given free range. For more in-depth reviews of the LG G4 head to websites Greenbot or PC Advisor. The latter awarded it four out of five stars, while Greenbot was a bit more generous, adding a half-star.